Several of the major Carboniferous lineages of tetrapods survived into the Permian (290-251 Myr ago) and beyond. These include groups such as the Anthra-cosauria, Aiistopoda, Nectridea and Microsauria, most of which died out by the end of the Early Permian, as well as the Temnospondyli, which lasted much longer, and two groups that were typically Permian, the Seymouriamorpha and the Diadectomorpha. These last three groups will be described now. The temnospondyls radiated extensively after the Carboniferous, splitting into some 30 lineages (Yates and Warren, 2000). They are noted for their broad, rather frog-like, skulls that were well adapted for sucking in prey underwater, and also for buccal pumping (see Section 4.1.3). Among Early Permian temnospondyls were a number of terrestrially-adapted forms. Eryops from the Lower Permian of North America (Figure 4.17(a)) has heavier limbs and a more massive skeleton than its earlier relatives. This 2-m-long animal was one of the top carnivores of its day, feeding on smaller tetrapods and on fishes. The dissorophid temnospondyls were probably fully terrestrial in habit. They have short skulls (Figure 4.17(b)) with huge orbits and a large ear drum. Other Early Permian temnospondyls, such as archegosaurids,were gharial-like fish-eaters. The branchiosaurs represent an interesting side-branch in temnospondyl evolution in the Upper Carboniferous and Lower Permian of central Europe in particular. These small animals, 50-100 mm long, show larval characters (Figure 4.17(c, d)), such as external gills, and unossified elements in the wrist and ankle (i.e. they were still cartilaginous and had not turned into bone). At one time, the branchiosaurs were identified as the tadpole larvae of temnospondyls such as Eryops,but Boy (1972) has concluded that, while some may be larvae (cf. 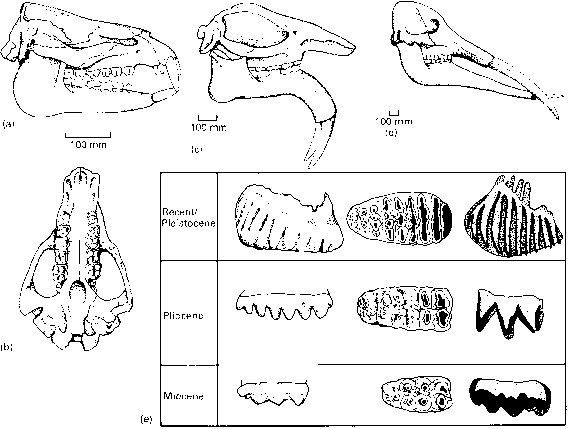 Figure 4.4), most are in fact paedomorphic adults, sexually mature animals with juvenile bodies (see p. 12). The anatomy of the Branchiosaurus skull in particular (Figure 4.17(d)) shows so many synapo-morphies with the dissorophids (Figure 4.17(b)) that Milner (1982) has interpreted the branchiosaurs as a paedomorphic sister group. At the end ofthe Permian, the temnospondyls largely died out, except for three main lineages, Tupi-lakosaurus, and the progenitors of the Capitosauria and the Trematosauria (Schoch and Milner, 2000; Shishkin et al., 2000; Yates and Warren, 2000). Tupilakosaurus was a last surviving member of the Dvinosauria, a clade known mainly from Russia, consisting of animals from 0.5 to 1m long, with broad skulls (Figure 4.17(f)) marked by radiating sculpture and obvious lateral line grooves. The capitosaurs, known only from the Triassic, diversified to include a number of genera of large flat-headed semi-aquatic or completely aquatic animals, some of them 3-4m long. Benthosuchus (Figure 4.17(g)) was common in the Lower Triassic of Russia. Capitosaurs dominated the freshwater ponds,lakes and rivers of the Triassic, but they became extinct before the end ofthe period. The trematosaurs include a number of lineages, most of them Triassic in age, and most of them aquatic. The plagiosaurs, such as Plagioscutum (Figure 4.17(h)), had remarkably short, broad skulls and reduced limbs, and they were highly aquatic. Until 1980, it was thought that the last temnospondyls died out at the end of the Triassic, but two families, the Chigutisauridae and Brachyopidae, survived much later. An Early Jurassic chigutisaurid was reported from Australia in 1983, then a Mid-Jurassic brachyopid from China in 1985, then a Late Jurassic brachyopid from Mongolia in 1991, and finally an Early Cretaceous chigutisaurid, Koolasuchus, from Australia (Warren et al., 1997). The chigutisaurids and brachyopids seem to have survived very late in Australia and Asia, perhaps in isolated basins that were not invaded by crocodilians, but the temnospondyls were distinctly rare after the Triassic.